Permanent cookies: Permanent cookies are saved on your computer and are not deleted automatically when you close your browser. A permanent cookie makes it possible to disable the message about cookies on hilary-swank.com after you have clicked ‘Accept’. 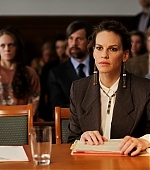 Third party cookies: Hilary Swank Fan is active on various social media platforms (Facebook, Twitter, LiveJournal) with the purpose of strengthening our online presence and visibility. These social platforms may set cookies for sharing content or for producing access statistics. The presence, number and status of cookies may depend on how you use the platforms concerned before or while visiting this website.